Keep as many as 8 fishing rods handy and secure on your boat's deck or gunwale with this stylish and useful rod tie-down kit. Sharp looking and built to last, it protects your rods from damage and from going overboard, providing peace of mind. 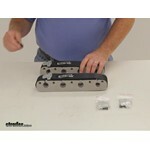 Call 800-298-8924 to order BoatBuckle boat accessories part number IMF15435 or order online at etrailer.com. 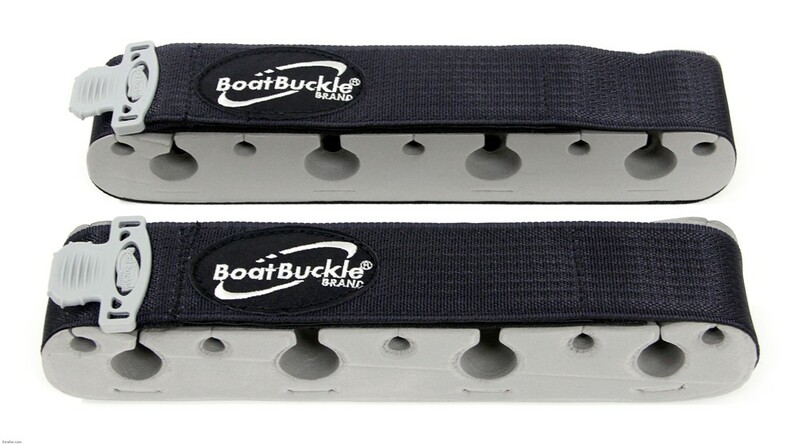 Free expert support on all BoatBuckle products. 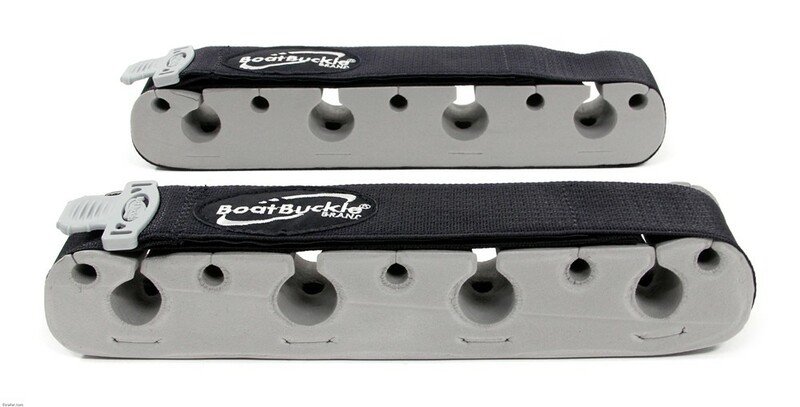 Guaranteed Lowest Price and Fastest Shipping for BoatBuckle Vertical Rod Hold-Down PLUS System - 8 Rods with Reels - Deck or Gunwale Mount. Boat Accessories reviews from real customers. Keep as many as 8 fishing rods handy and secure on your boat's deck or gunwale with this stylish and useful rod tie-down kit. Sharp looking and built to last, it protects your rods from damage and from going overboard, providing peace of mind. RodBuckle Retractable Fishing Rod Tie-Down Strap with Concealed Mounting Kit - 2" x 24"
Keep your fishing poles handy and secure on the deck of your boat with the RodBuckle. The retractable strap extends over your poles and locks into position on the deck. 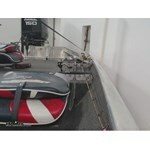 The included mounting kit conceals the unit inside the boat's gunwale. 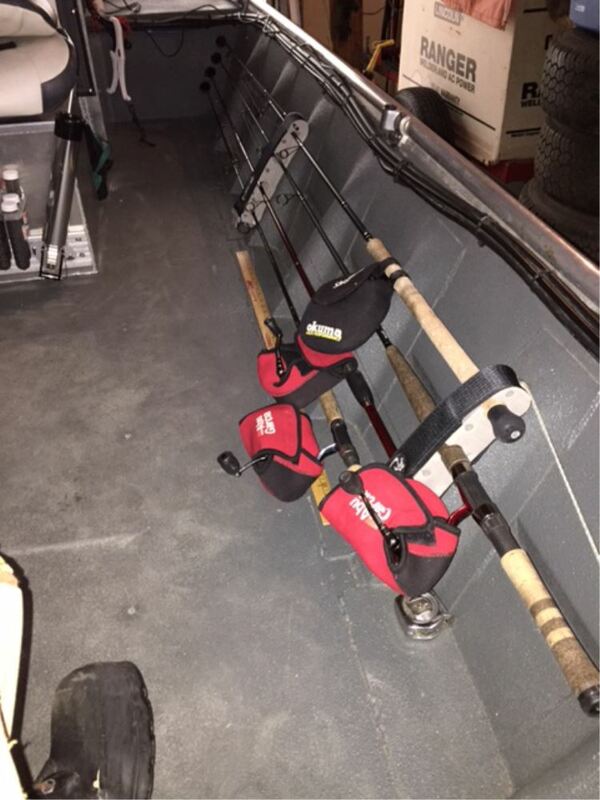 Store up to 7 fishing rods, gaffs, or boat hooks horizontally with these 2 vacuum cup holders. Installs and removes quickly on your gunwales or side walls, or inside your SUV or truck bed. Rubber inserts with hook-and-loop fasteners keep rods secure. Today we're going to review part number IMF15435. 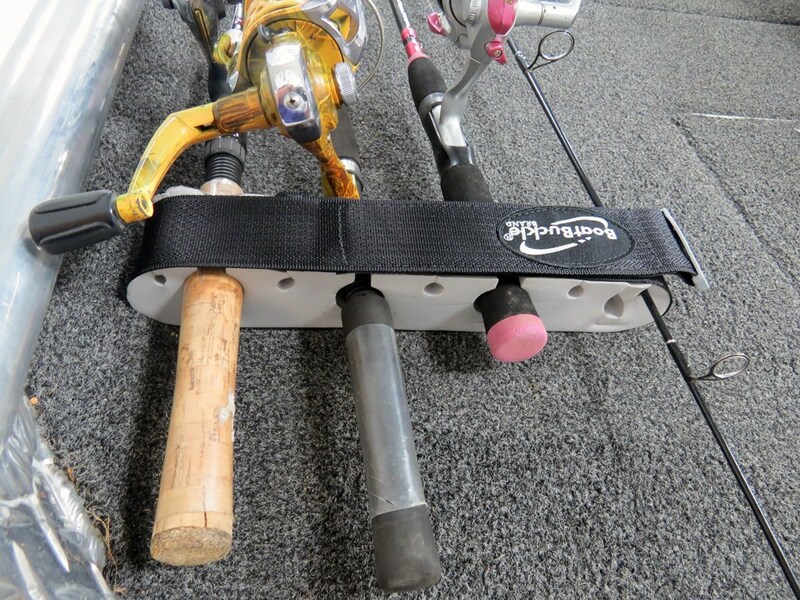 This is the BoatBuckle Rod Hold-Down PLUS System. 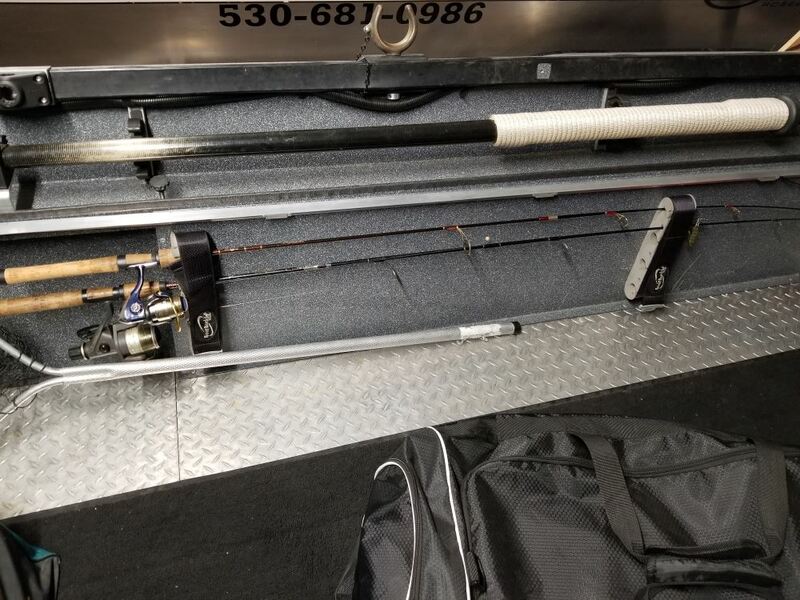 This is a hold-down system that will keep as many as eight fishing rods handy and secure on your boat's deck or gunwale with this rod tie-down kit. 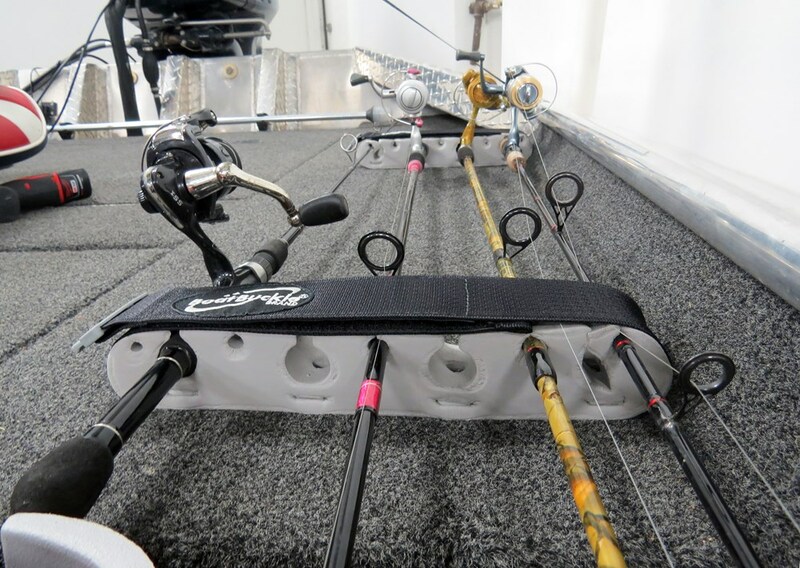 This rod tie-down kit will protect your fishing rods from damage and from going overboard. They have a sturdy polyester strap, with a hook and loop closure, and a foam-molded insert, which will keep your fishing rods in place. The straps will loop around the foam insert, and hook together. You can slide up to four handles on this side and then four handles from this side. 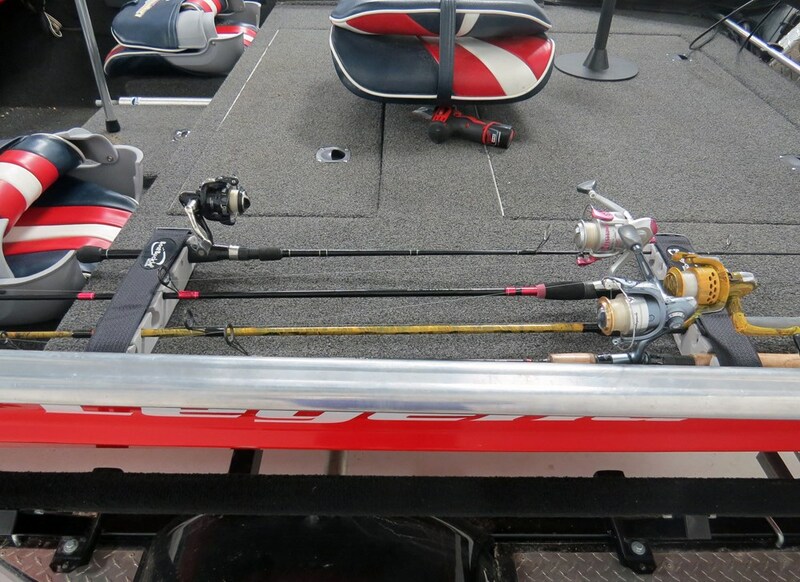 When they're across from each other, the tips of your fishing rods would fit in to the smaller holes on top. So, you'll be able to hold four rods facing that way and four rods facing the other way; a total of eight rods. The polyester webbing is seatbelt quality polyester webbing. It does have a sure-grip rubber coated release handle; makes it easy to grip and control with one hand, and just again to show you this foam insert, basically there's the four larger holes, for the handles of them fishing rods; and up here, the smaller holes are split so you could lay in the tip of your fishing rod. The way this would be installed is it comes with the mounting hardware. 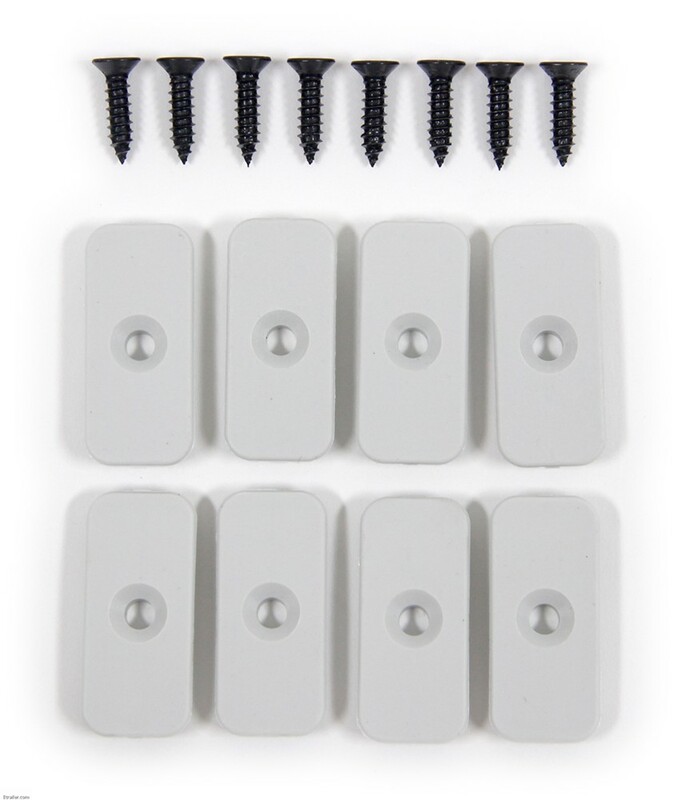 Each one of these hold down systems come with four plastic mounting grommets and the four screws. Basically, what you would do, is you would slide these, there's a little slot here and then there's a screw right here. We'd push this into the slot and force it until this hole would line up there. Then once it's inside, you would drill a pilot hole down through there to wherever you're going to mount it and that would keep it when there's four of them, one for each hole. Then that would keep it mounted and then you put your fishing rods in, close the hook and loop, and just tighten it down. Again, it has the capacity of carrying eight fishing rods with reels. I'll give you the dimensions on this. The width is going to be 2-inches wide and the overall length is 11 inches. This part does come with a one year limited warranty and that should do it for part number IMF15435..
Order: RelevanceNewestRating - High to LowRating - Low to High Keep as many as 8 fishing rods handy and secure on your boat's deck or gunwale with this stylish and useful rod tie-down kit. Sharp looking and built to last, it protects your rods from damage and from going overboard, providing peace of mind. The covers have been exposed to the elements and does not show any fading or deterioration. The boatbuckel rod holder gets lots of use and is starting to show some wear. However the level of wear is expected and is still in overall good condition. I expect to get several more years out of it before needed to replace. Thanks, the products are still working Great in fact one of the motivating factor of buying these from you was the low price you sell them for in fact Im going to order some of the same to outfit another boat i bought for my Fishing Guide Service. Thanks again for checking in with me really appreciate it. The boat buckle is perfect Im very happy with the product. 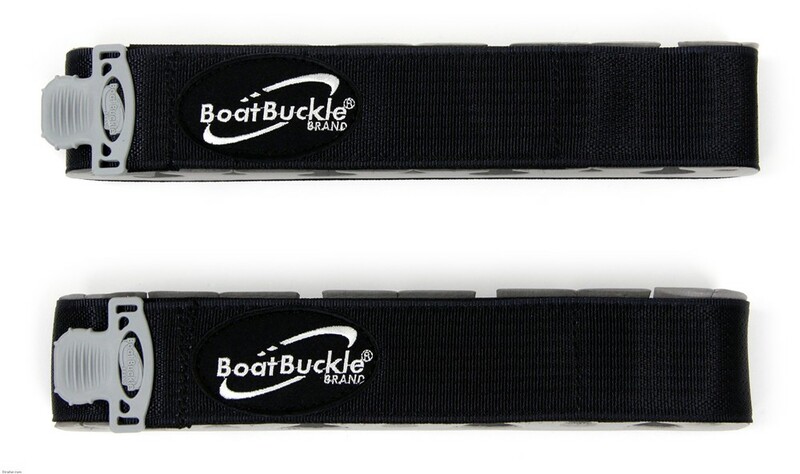 Each BoatBuckle Verticle Rod Hold-Down # IMF15435 comes with two foam closures to secure your rods down. 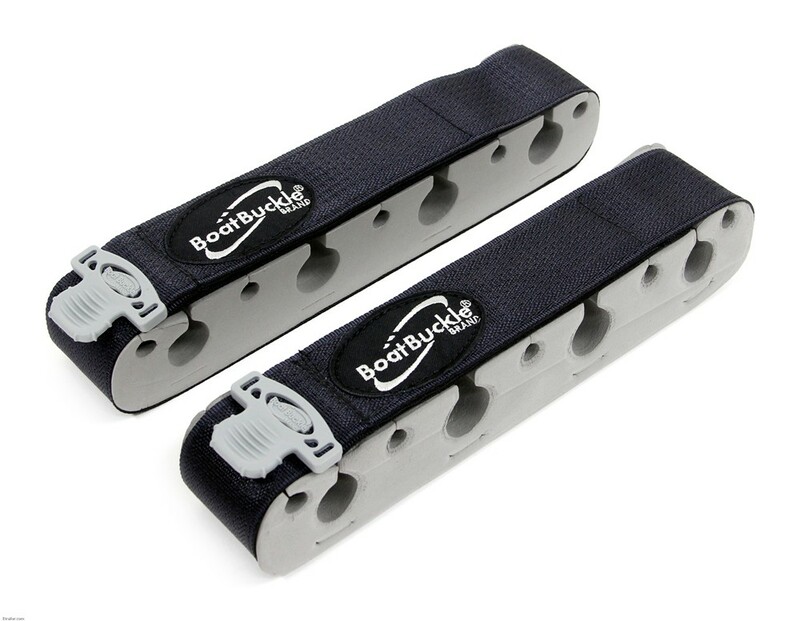 So if you buy one BoatBuckle Hold Down, you will have two foam pads to secure up to 8 rods. You will not need to buy two BoatBuckle Hold Downs for one application. I attached a review video of the Hold Downs you may want to check out. 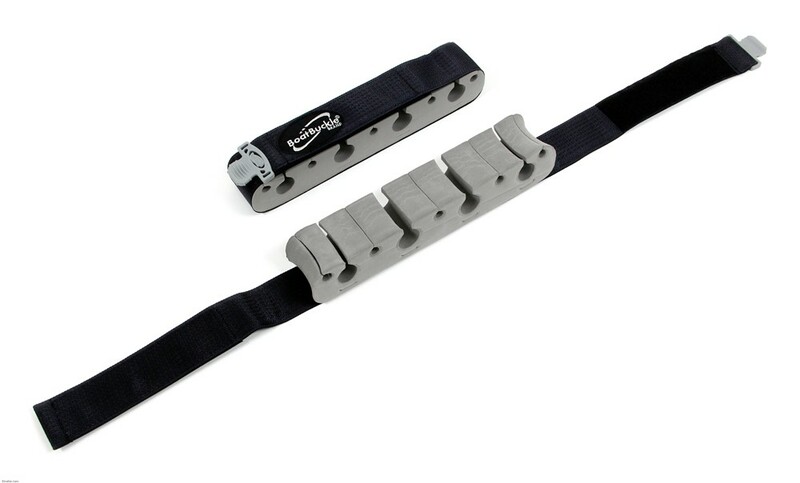 The BoatBuckle Rod Hold-Down PLUS System # IMF15435 is intended for deck- or gunwale-mounting but it absolutely could be installed, using appropriate alternate hardware you'll supply, to other surfaces such as the inside of a camper shell. You'll just need to source sutable hardware for the particular material at the installation point (metal vs. fiberglass). 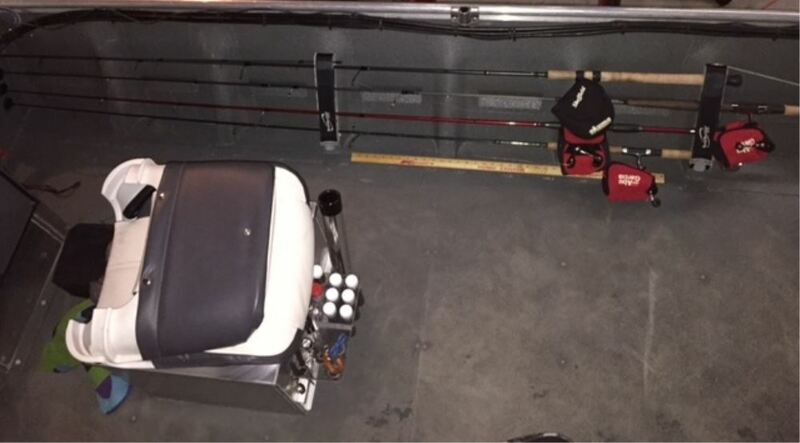 We also offer the RodBunk Deluxe Fishing Rod Carrying System for Trucks # IMF17727 which is shown in the linked video. Thank you very much, Great service!!!!!!!!! !